Zack Lightman has grown up without his father, but has learned of him from the journals he left behind. As a teenager, he knows that the virtual reality games he plays are fantasy, that his father is dead and nothing can change these facts. Then how does he explain that he saw an alien space ship that is identical to the one from his favourite online game. It's time to grow up quickly when Zack is faced with a string of seemingly impossible situations. There is no time to consult his mom or his best friends, he has to act immediately as lives are at stake. I really enjoyed this book. It moved at a quick pace and was jam packed with action. At the same time, the story line didn't seem rushed. There was ample detail and descriptions to satisfy both teen and adult readers. Having watched my children and various nephews playing their online games, I feel that this story accurately portrays teens and their passion for gaming. The level of skill they show and how immersed they got into their games was nothing different that what happens in front of my gaming console. 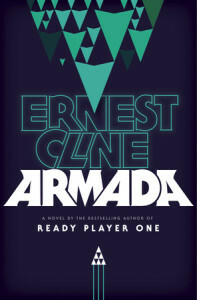 I particularly enjoyed how author Ernest Cline drew in real world examples of movies and games to support the plot line, particularly including reference to the movie The Last Starfighter. I would not hesitate to recommend parents to purchase this book for their teen reader, though they might want to read it first as I suspect the recipient won't be putting it down once started. Thanks to Read it Forward and Crown Publishers for my review copy. Visit Read it Forward to learn how you can enter to win your copy of soon to be published novels. Intrigued by the cover. Alas this doesn't sound like a book I'd probably enjoy though it certainly isn't one I'd rule out either. Insightful review, thank you.